We love weddings, we adore the celebration of love, we can't get enough of families and friends joining together to help a couple start their married life together. And we really, really, really love when there's two wedding dresses involved! The completely gorgeous Katie and Laura nabbed The Chimney House to sit down with their closest friends and family and celebrate their Kelham Island wedding. Kelham Island Museum hosted the ceremony and the evening reception, and the girls invited their nearest and dearest to The Chimney House to eat pie, drink fizz and celebrate in between! Arriving into our candlelit haven, thirty-three guests took their seats around our 20ft antique dining tables laden with flowers, and tucked into steak and Kelham Ale pie, and tender butternut squash & feta pie, with lashings of creamy mashed potato, tonnes of seasonal veggies, and obviously plenty of Hensderson's Relish... resoundingly the best pie they'd ever had! Rhubarb crème brûlée finished off the feasting, with perfectly caramelised crispy tops to crack through - heavenly! Heartfelt speeches and fizz toasts, with our framed screen in the background flicking through pictures of Katie and Laura, and all of the people who had helped them along the way. What a beautiful day to celebrate a gorgeous Sheffield couple. One of Katie and Laura's guests even cross-stiched them a gorgeous memento of their afternoon at The Chimney House! 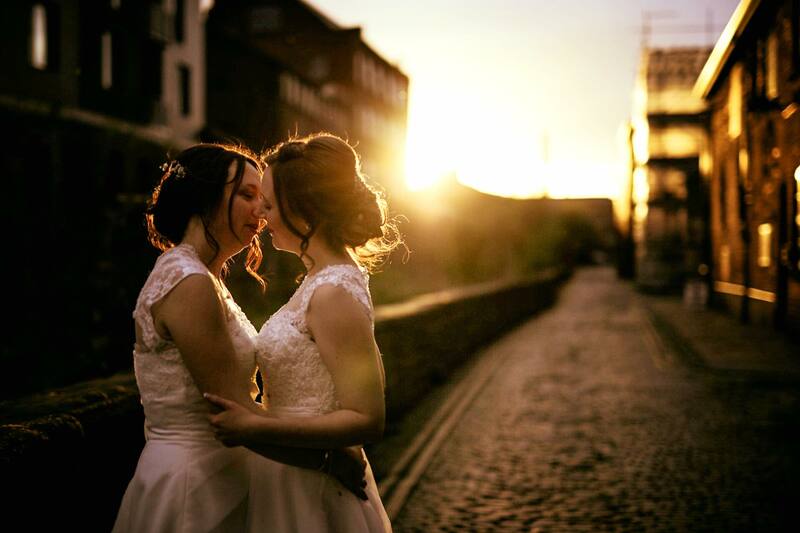 Just look at Stu Ganderton's gorgeous pic of the pair in the setting sun on our cobbles... completely dreamy!